After I finished The Detour (you can read my review of it here) I was still waiting for a copy of The Book Thief by Markus Zusak to come into the library (I feel as if I’m one of the only people not to have read this yet!) so I wanted something relatively quick to read while I waited. I browsed my bookshelves and decided on The Jungle Book by Rudyard Kipling. Despite watching Disney’s 1967 version of The Jungle Book countless times as a child, I’d never read the book. My sister found me a 1926 edition of the first of the Jungle Books (is it just me who never knew there were two books?) in a charity shop at Christmas, so I decided it was about time I read it. I always find it interesting rereading books I loved as a child or reading books of films I loved when I was younger – is the magic I remember still nestled within the book’s pages? Do I still feel engrossed in the story? What did the film makers change? Does the book offer more than the film? Before reading the first of Kipling’s The Jungle Book I hadn’t realised that Disney’s film of the same name was only based on the Mowgli stories which appear in the two Jungle Books alongside other short stories. Reading the first of the stories featuring Mowgli felt familiar and I couldn’t help picturing Disney’s versions of Mowgli, Baloo, and Bagheera. What struck me though was how savage and violent these stories were – there are definitely no singing bears and monkeys, but the harsh reality of life in the jungle. These stories are about life, death, survival, and fitting in. While the Mowgli stories were probably my favourite because of their familiarity, I enjoyed the other short stories in this volume. Many of these stories are about animals using their intelligence to get justice or to do right by themselves and other animals, and so certainly feel like moral children’s stories in this way. I really enjoyed that, in each of the stories, the animals had their own customs and laws – Kipling has created a full and oddly believable world in these short stories. I would really like to find the second Jungle Book to match my copy, partly to have a matching set, but also to read the other stories. While I feel as if I wanted to enjoy The Jungle Book more than I did, it was interesting to see the difference between reading the book as an adult and my memories of watching the Disney film as a child. While it’s been many years since I watched the film, I feel like the Mowgli stories and other accompanying tales in Kipling’s book had far more depth. Reading The Jungle Book made me want to read other novels or short stories that Walt Disney based films on – Peter Pan springs to mind as I’ve never read it. Have you ever revisited favourite books from your childhood? Or read the book of a film you used to watch as a child? 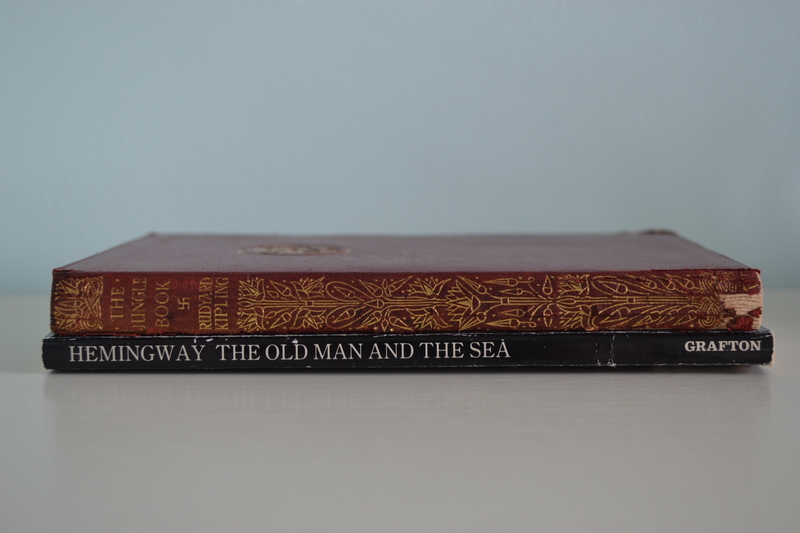 Ernest Hemingway’s The Old Man and the Sea was the next book I found when looking through my bookcase. I’ve had this on my shelf since my last year at University when it was put on a reading list, only to be taken off just after I’d bought it! Once again, I was looking for something relatively short to read and, at 109 pages, The Old Man and the Sea seemed the perfect choice. The Old Man and the Sea is written from the perspective of an old fisherman who has gone eighty four days without catching a fish. We go out to sea with him on the eighty fifth day when he attempts to catch a giant marlin. I found this novella incredibly touching. It’s a short and simple tale yet it’s loaded with meaning and themes. It’s a story of determination and perseverance, overcoming obstacles and working through struggles, victory and defeat, old age, and nature. I love the qualities of the old man: he’s patient, optimistic, persistent, and strong but he’s aware of his weaknesses. Hemingway’s prose matches the simplicity of the plot and works wonderfully to create the old man and transport readers into the boat with him. After finishing the novella I keep thinking about it, despite now reading another novel. The Old Man and the Sea is a sad and touching tale, but one I know that I will return to, certain that I’ll unearth new meanings with each reading. Have you read The Old Man and the Sea or any other of Hemingway’s novels? The thing about Peter Pan is, there are a number of versions of the Peter story, some quite a bit different from th play on which I think, the movie is based. PP in Kensington gardens is one of these short novels. Reminded me a bit of The water babies. Greene said his novels fell into categories, one being entertainments and the other sort serious novels. I can never tell the difference.